You can win in one of two ways: score 30 victory points or play and complete a dominance card. Dominance cards cannot be played early in the game, so we recommend learning about them later. 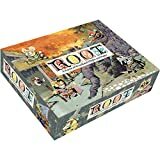 In Root, you will play one of four factions. Each scores victory points in its own way. The invading Marquise de Cat wishes to exploit the Woodland, using its vast resources to fuel her economic and military machine. She scores by constructing buildings in the Woodland. 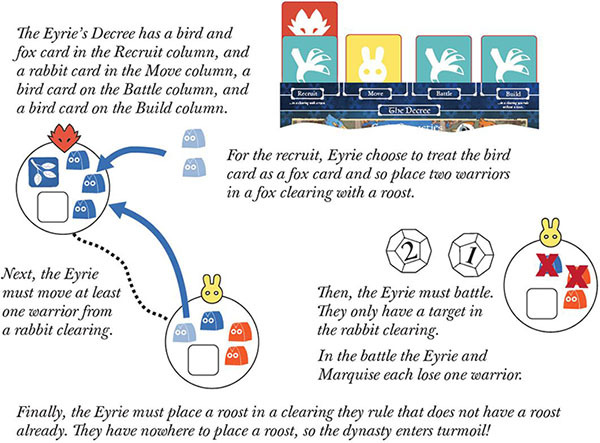 The proud Eyrie Dynasties wish to reclaim the glory of their once-great aristocracy and retake the Woodland from the Marquise. They score each turn by building and protecting roosts in the Woodland. The upstart Woodland Alliance wish to unite the creatures of the forest and rise up against their oppressors. They score by spreading sympathy for their cause across the Woodland. The wily Vagabond wishes to gain fame-or infamy-in the midst of this brewing conflict. He scores by completing quests for the creatures of the Woodland and by aiding and harming the other factions. As you read on, you'll learn more about the factions and how they score points, along with a couple ways that any faction can score points. If playing with three players, remove the Vagabond. If playing with two, also remove the Alliance. Each player chooses a faction board and takes all of their faction's pieces. The back of each faction board lists all of its pieces and gives its basics of play. Place the score marker for each faction in play on "0" on the score track. Shuffle the shared deck of 54 cards, and deal three cards to each player. Do not confuse this shared deck with the types of cards used by specific factions, as listed on the backs of their faction boards. Place the four ruin chits on the four slots on the map marked with "R". Gather the 12 item chits shown to the right and place them on their matching spaces near the top of the map. Hand out the 16 faction overview cards as desired, and place the two custom dice near the map. 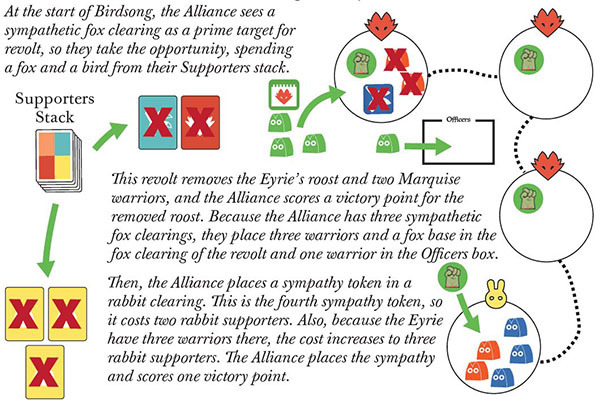 The players set up their factions, as described in Setup on the back of each faction board, in this order: Marquise, Eyrie, Alliance, Vagabond. After a player completes all three phases, the next clockwise player begins their turn. Play continues until one player has won the game by reaching 30 victory points. 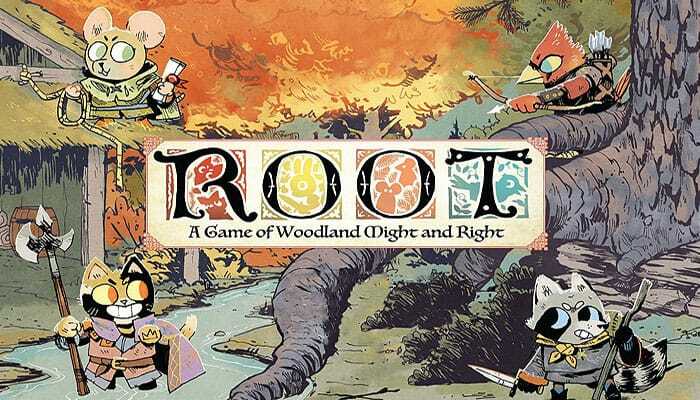 Most action in Root unfolds on the map of the Woodland, consisting of 12 clearings connected by paths. A river runs through some clearings. Only use the river if the Riverfolk Company, an expansion faction, is in play. You can move from clearing to clearing. When you move, take any number of your warriors from one clearing and move them to a clearing connected by a path. The spaces on the Map enclosed by paths are forests, which only the Vagabond can move into. To move, you must rule the clearing you are moving from or moving to. You rule a clearing if you have the most combined warriors and buildings there. On a tie, no one is ruler. Various other actions in Root will require you to rule clearings. 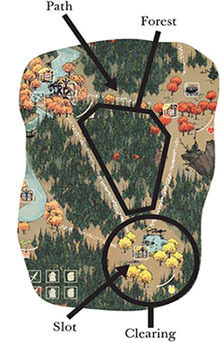 Each clearing on the map has one to three slots, which hold buildings that players will place. A clearing with no open slots cannot hold more buildings. Slots filled with ruins cannot hold buildings until the Vagabond explores them. Without a Vagabond, these slots will be blocked for the entire game. Each clearing also has a suit: fox, rabbit, or mouse. A clearing's suit represents the community living there. A clearing's suit is shown both by its symbol and by the color of the clearing's trees. Throughout play, you will draw cards from Root's shared deck into your hand, and many actions will require you to spend cards from your hand. Spending a card represents calling upon animals to lend you their labor, to do you a favor, or to broker a deal. Just like clearings, each card has a suit. Besides the fox, rabbit, and mouse suits, cards have a fourth suit: bird. Birds Are Wild: The birds live in the treetops across the whole Woodland, so you can always treat a bird card as a mouse, fox, or rabbit card. However, if you must spend a bird card, you can't substitute a card of another suit. Most cards have a second use-you can craft the card to gain its effect, shown at the bottom. To craft a card, you must activate crafting pieces in the clearings shown in the card's bottom-left corner. You can activate each crafting piece only once per turn. Each faction has a different crafting piece, as follows. If the card gives you an immediate effect, resolve it and then discard the card. A common immediate effect is to take an item from the map's supply and place it in the Crafted Items box in the top-right corner of your faction board. Whenever you craft an item, you score the victory points listed on the card! If the supply does not have the matching item to take, you cannot craft the card. If the card gives a persistent effect, tuck the card under your faction board to show only its effect, which you may use as written. You may not craft a card with a persistent effect if you already have one of the same name. You can battle other players to remove their pieces from the map. When you battle, choose any clearing where you have any warriors. You are the attacker, and you choose another faction with any pieces there as the defender. First, roll two dice. The attacker deals hits equal to the higher roll, and the defender deals hits equal to the lower roll. However, each player can roll no more hits than their number of warriors in the clearing of battle. Then, remove pieces. Both players remove pieces at the same time. 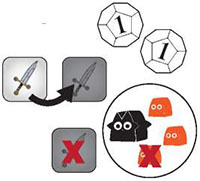 The player taking hits chooses which pieces to remove, but must remove all their own warriors in the clearing of battle before removing any of their own buildings or tokens there. Whenever you remove an enemy building or token-even outside battle-you score a victory point! Some effects allow you to deal extra Hits. Extra hits represent superior positioning, tactics, or leadership. 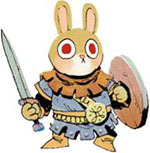 They are not limited by the number of warriors in the clearing of battle, so a single warrior could deal multiple hits. The attacker deals an extra hit if the defender has no warriors in the clearing of battle, leaving themselves defenseless. 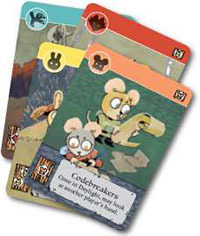 Before the roll in battle, the defender may play an ambush card whose suit matches the clearing of battle to deal two hits immediately. Since ambushes deal hits immediately, they can reduce the maximum number of hits the attacker can roll. However, if the defender plays an ambush card, the attacker can foil the ambush, canceling its effect, by also playing a matching ambush card. Like extra hits, ambush hits are not limited by your number of warriors in the clearing of battle. You can even play an ambush card if you're defenseless! If you've got an ambush card in hand, don't be afraid to bait your enemies into attacking you where you seem weak. If an ambush card removes all of the attacker's warriors, the battle immediately ends. 'The Marquise de Cat occupies the Woodland and wants to turn it into an industrial and military powerhouse. Each time the Marquise builds one of her buildings -a workshop, sawmill, or recruiter-she scores victory points. The more of the same building she has on the map, the more points she scores. However, to fuel ongoing construction, the Marquise must maintain and protect a strong, interconnected economy of wood. The Keep of Marquise de Cat grants two special abilities while it is on the map. First, no one but the Marquise can place pieces in the clearing with the keep token. 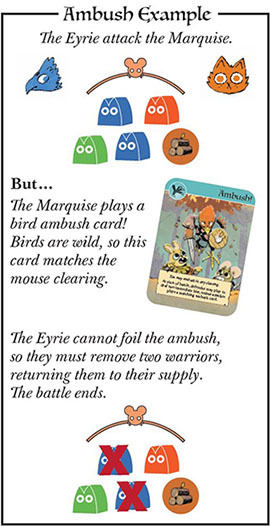 Also, whenever Marquise warriors would be removed, the Marquise may call on her Field Hospitals, spending a card matching the warriors' clearing to place them back in the clearing with the keep token. First, you can craft any cards in your hand using workshops. Then, you can take up to three of the following actions. Battle: Initiate a battle. by spending one bird card per extra action. Recruit: Place one warrior at each recruiter. You may take this action only once per turn. 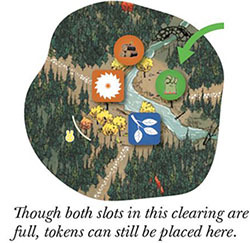 Build: Place one building in a clearing you rule with an open slot by spending wood tokens equal to its cost. You may spend any wood on the map connected to this clearing by any number of clearings you rule. When you place the building, score the victory points revealed on your faction board. Overwork: Spend a card to place one wood token at one sawmill in a clearing whose suit matches the card spent. Unless otherwise noted, a faction may take actions listed in the same phase in any order, and may take a given action multiple times. Draw one card plus one card per uncovered draw bonus. Then, if you have more than five cards in your hand, discard down to five. Most of the other factions draw and discard during Evening in exactly the same way. 'The Eyrie Dynasties wish to restore their once-dignified kind to their former glory in the Woodland by resettling the forest clearings. During their Evening, the Eyrie score victory points from their number of roosts on the map. The greater their presence, the greater their gains. However, the Eyrie are bound by their Decree, an ever-increasing set of mandated actions promised by their leader. Each turn, they must take all of the actions on their Decree, or else fall into turmoil. The Eyrie are the Lords of the Forest. They rule a clearing even when tied for presence. However, their Disdain for Trade means they score less when crafting items. You must add one or two cards onto any columns in the Decree. Only one card added may be a bird card. Emergency Orders: If you have no cards at the start of Birdsong, draw one. A New Roost: If you have no roosts, place one roost and three warriors in the clearing with the fewest warriors. First, you may craft any number of cards, using roosts. Then, you must resolve the Decree, starting with the leftmost column and moving right. In each column, you may resolve cards in any order. Recruit: Place a warrior in a matching clearing with a roost. Move: Move at least one warrior from a matching clearing. Battlle: lnitiate a battle in a matching clearing. Build: Place a roost in a matching clearing you rule with an open slot and no roost. 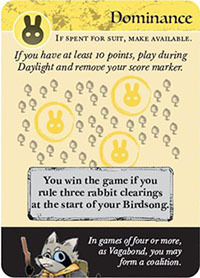 First, score the victory points shown on the rightmost empty space of your Roosts track. Then, draw one card plus one per uncovered draw bonus. If you have more than five cards in your: hand, discard down to five. First, your regime is humiliated. Lose one victory point per bird card in the Decree. Then, your court is purged. Discard all of the cards in the Decree except the two Loyal Vizier bird cards. Next, your leader is deposed. Flip your current leader face down and set it aside, choose a new leader from those face up, and place it on your faction board. Then, tuck your Loyal Viziers into the Decree spaces listed on your new leader. Finally, you rest. End Daylight and go to Evening. There are many ways to fall into turmoil! For example, you might not have any warriors in your supply to recruit, or maybe all the clearings you rule already have a roost, meaning you can't build any more. 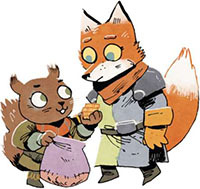 The Woodland Alliance works to gain the sympathy of the various oppressed creatures of the Woodland. Each time the Alliance places a sympathy token, they score victory points. The more sympathy on the map, the more victory points they score. Gaining the sympathy of the people requires supporters, cards on the Alliance's faction board. These supporters can also be put toward violent revolt. A revolt establishes a new base, allowing the Alliance to train officers that increase their military flexibility. The Alliance are experts in Guerrilla War. When defending in battle, the Alliance uses the higher roll and the attacker uses the lower roll. To act as the Alliance, you often spend supporters-cards in your Supporters stack. Supporters are separate from your hand of cards, and you can only spend supporters for their suit. For example, you couldn't craft a card in the Supporters stack or play an ambush card there to deal hits. Supporter Limits: If you don't have a base on the map, you may only have up to five supporters. Discard any excess cards. Supporters are often spent to place sympathy tokens. Placing sympathy is the main way you score victory points, and sympathy can gain you more supporters through Outrage. 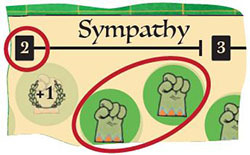 Whenever another player removes a sympathy token or moves any warriors into a clearing with a sympathy token, they must add a card from their hand matching that clearing to your Supporters stack. If they don't have a matching card, they show you their hand, and then you draw a card from the deck and add it to your Supporters stack. You may revolt any number of times, and then spread sympathy any number of times. Revolt: Spend 2nvo supporters matching a sympathetic clearing. Remove all enemy pieces there and place the matching base. Then, place warriors there equal to 2he number of sympathetic clearings matching the suit of the revolt clearing, including the revolt clearing itself. Last, place a warrior in the Officers box. Whenever you remove a you'll have to remove half your officers and discard all supporters matching the suit of that base-even your bird supporters! Spread Sympathy: Place a sympathy token in an unsympathetic clearing, adjacent to a sympathetic clearing if possible. You must spend supporters as shown by the cost on your Sympathy track. If the target clearing has three or more warriors of another player, you must spend another matching supporter to place sympathy there. If there are no sympathy tokens on the board, you can place your first sympathy in any clearing. You may take the following actions. Unlike in Birdsong, these cards come from your hand, not your supporters. Craft: Craft a card, using sympathy tokens. Mobilize: Add a card to the Supporters stack. Train: Spend a card whose suit matches a built base to place a warrior in the Officers box. ^iis warrior is now an officer. Your officers determine the number of military operations you can take during Evening. Without officers, you can't move or battle with your warriors! Training officers will also let you recruit new warriors and place sympathy tokens without spending supporters. You may take these military operations, up to your number of officers. Recruit: Place a warrior in a clearing with a base. Organize: Remove one of your warriors from an unsympathetic clearing to place a sympathy token there. Score the revealed victory points. After you finish military operations, draw one card plus one per uncovered draw bonus. Then, if you have more than five cards in your hand, discard down to five. 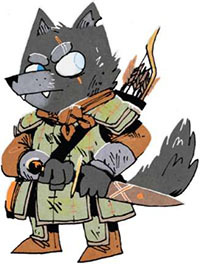 The Vagabond plays all sides of the conflict, making friends and enemies as suit his ends, while going on quests to increase his renown throughout the wood. As the Vagabond improves his relationships with other factions, or removes pieces of factions hostile toward him, he scores victory points. Being a Lone Wanderer, the Vagabond cannot rule a clearing or stop another player from ruling one, but he is Nimble, so he can move regardless of who rules his clearing. The Vagabond only has one piece: the Vagabond pawn. This pawn can move and battle just like a warrior, but it is not a warrior. To move and act effectively as the Vagabond, you must manage your items, expanding your selection by exploring the Woodland's ruins and providing aid to other factions. At any time, an item can be damaged or undamaged, and an item can be either face up or down. You can exhaust an undamaged face-up item to perform an action. in your Satchel, and you will have to discard down to your item capacity during Evening. Flip two items face up per on its track at the start of Birdsong, then flip three more face up. Then, you may slip once, moving into an adjacent clearing or forest without exhausting any . Slip is the only way you can enter a forest! You can take various actions by exhausting items, flipping them face down. Move: Exhaust a to take a move. Battle: Exhaust a to initiate a battle. Strike: Exhaust a to remove a warrior in your clearing. If a player has no warriors there, you can instead remove a building or token of that player. Explore: Exhaust a to take one item from a ruin in your clearing and score one victory point. Remove the ruin from the map. Aid: Exhaust any one item, and give a card from your hand matching your clearing to any player in your clearing. Then, take one item, if any, from their Crafted Items box. Quest: Claim a quest whose suit matches your clearing by exhausting the two items listed on the quest. Place the claimed quest into your play area. Then, you may draw two cards from the deck, or you may score one victory point per quest of this suit that you have completed, including this one. Finally, draw and put out a new quest. Craft: Exhaust equal in number to the suits shown on a card's crafting cost. All of your match the suit of your clearing. Repair: Exhaust a to repair a damaged item. Special Action: Exhaust a go take the action listed on your character card. If you are in a forest, repair all of your damaged items. Then, draw one card, plus one card per on its track. If you have more than five card s in your hand, dds card down to five. 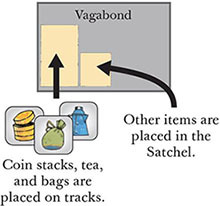 Finally, if you have more items in your Satchel and Damaged box Vagabond's than your item limit -six plus two per on its track-you must Draw Bonus remove items from your Satchel down to your item limit. Return any removed items to the box. Unlike other factions, the Vagabond does not uncover draw bonuses, but instead gets draw bonuses as items. 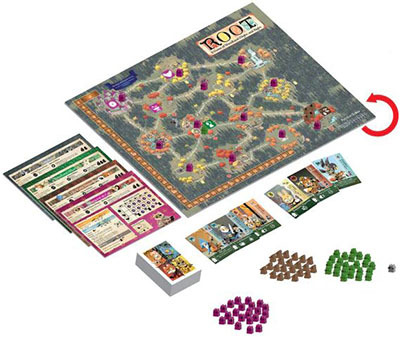 This item only adds a bonus draw if it is undamaged and face up on its matching track. You can freely move face-up, undamaged , , and between your Satchel and their tracks. If you exhaust a , , or , you must move it to your Satchel. When an item is damaged, move it to your Damaged box in your Satchel. When an item is repaired, move it out of the Damaged box and back to the Satchel. Your Relationships chart represents how friendly or hostile other factions are toward you. You can improve a relationship with a faction by giving them cards with the Aid action. During the same turn, you must take the Aid action the number of times shown between their current relationship space and the next one. When you improve a relationship, you score the victory points listed on the new space. When you reach the Allied space, you may move and battle with that faction's warriors. For more, see Law of Root (9.2.9). If you ever remove a warrior, place its faction's relationship marker in the Hostile box. From now on, you score a victory point each time you remove one of their pieces in battle during your turn, along with any points you score for removing buildings and tokens. However, you must exhaust another whenever you move into a clearing with any Hostile warriors. Because you don't have warriors, you follow a few different rules in battle. The Vagabond pawn is not a warrior, so you can't rule and you are not affected by effects that refer to warriors. You can battle where your pawn is. The maximum hits you can deal by rolling equals your total undamaged , whether exhausted or not. You take hits by damaging items of your choice. If you have no undamaged items, you ignore further hits. You are defenseless, taking an extra hit, if you have no undamaged . The Vagabond is in a clearing with three Marquise warriors. He has two face-up swords in his Satchel. After a long and fruitful relationship with the Marquise, the Vagabond is ready to betray his friend. He exhausts a sword to battle the Marquise. The Marquise doesn't play an ambush card. The Vagabond then rolls the dice, rolling a 1 and a 1. The Vagabond deals one hit and moves the Marquise's relationship marker to Hostile. The Marquise also deals one hit, so the Vagabond chooses to damage the exhausted sword. Undeterred, he exhausts his second sword to battle again. The Marquise doesn't play an ambush card. The Vagabond then rolls the dice, rolling a 2 and a 0. With only one undamaged sword, the Vagabond can only deal one hit. Because he removed a warrior of a Hostile faction, the Vagabond scores one point. The deck has four dominance cards, one in each suit. Like ambush cards, these cards cannot be crafted, but they can be spent for their suit. When you discard or spend a dominance card for its suit, do not discard it! Instead, place it near the map. Any player, during their Daylight, may pick up a dominance card near the map by spending a card of matching suit. During your Daylight, if you have at least 10 victory points, you may play a dominance card into your play area to activate it. Remove your score marker from the score track. For the rest of the game, you can only win by meeting the victory condition listed on your activated dominance card. Your activated dominance card does not count against your hand size, and it cannot be removed from play or replaced. The Vagabond cannot rule clearings, but he can play a dominance card to form a coalition with the player other than himself with the lowest score. If there's a tie for lowest score, the Vagabond chooses which player to form a coalition with. When forming a coalition, the Vagabond removes his score marker from the score track and places it on the faction board of that player. Now, the Vagabond will share the victory if that player wins. A Vagabond can even form a coalition with a Hostile faction! If doing so, the Vagabond moves his partner's relationship marker to the Indifferent space. The first player to reach 30 victory points immediately wins the game. If multiple players reach 30 or more victory points simultaneously, the player taking the current turn wins. The deck holds four dominance cards, which can be played to win the game without reaching 30 victory points, but you must meet the victory conditions listed on the activated dominance cards. Whenever you remove an enemy's building or token, you score one victory point. Whenever you craft an item, you score the victory points listed on the card.